She hovered next to the barracks window for a moment too long. She had started to second guess herself. What if he did not want her company? He wasn’t her servant, at her beck and call. She had actual servants for that, and she could call them. He was a knight, bound or not. Ultimately, he served her father, and he did so well. But she didn’t want her servants – they could do nothing for her irrational fears. Her handmaid, though kind, and polite, and gentle, held no answers for her tonight. She did not need to be summoned for Zelda to understand this much. No, best to let her sleep. But Link? Perhaps he held nothing for her either, but in his presence, she felt…free. No pressures of the King, her father, and no eyes of the kingdom as she stumbled to find and harness her own destiny. Especially tonight. That dream…the woman in gold light, speaking to her without sound. It had to be none other than Hylia herself, chastising her, reminding her that she had a duty to her kingdom, and a gift yet undiscovered, despite her lifetime of attempts. She could see the goddess now, screaming at her, the Calamity comes. You must save them all. No, she had no real way of knowing what words had been spoken, and she was no good at lip reading, but if she were a goddess looking upon herself, she imagined those words to be her own. And this is why she should not have hesitated. This is why she had snuck from her balcony, in nothing but her sleeping gown, satin robe, and hiking boots, to seek the company of her companion and sworn knight. She needed to talk to him, about anything else. He had not been much for words before, but he had finally begun to open up to her. She still recalled the chill down her back when he told her he felt the eyes of the world upon him. They had driven him to silence, as they had driven her mad. And together, the two of them had slowly found sanctuary in each other, driven together by the pressures of destiny. She knocked, lightly, timidly, not sure he could hear. Run. Run now. Run fast. She shifted her weight to her back leg just as the window slid up and a blonde head popped out. No escaping now. Link glanced over his shoulder back into his room. His status granted him a living quarters of his own, one she knew gave him endless grief as his fellow knights of the Royal Guard ribbed him relentlessly. He held a rank of note before his appointment, at an extremely young age, and no others his equal held quarters as large. His was a living space of a General, and many laughed and poked and shouted “nepotism.” And he, being Link, sheepishly shrugged every time and waved it off without defense. She nodded. I interrupted him. He was busy, and I interrupted him. He disappeared back through his window for a moment, leaving her alone once more with her thoughts. She tried to block them. Not soon enough, he popped back out and offered his hand. She took it and hoisted herself through. The first thing she noticed of the room was how very empty it looked. It hardly lacked in furniture, housing a bed she suspected was more plush than his fellow knights’, a desk and chair, an armoire that looked out of place, and a dresser. Yet, where signs of life would normally grace a house, here, they remained conspicuously absent. No pictures of family and friends. No paintings, nor random plush pillows, nor clothes scattered around the room when they should have been in a basket for cleaning. Only a single, rust red blanket on the bed, and a small bookshelf, full of books she was sure he had memorized. She had never really been inside a Castle Town house before, but she had always imagined they’d be full of memories. The barracks should have been the same. This just saddened her. The Book of Link remained closed, even in his own home. “Sorry, I was not prepared for guests,” he said, straightening the books on his shelf. “Is that bragging?” Her mind was a whirlwind, and she was caught deep within the storm. “It worked.” She smiled shyly and glanced down at the desk once more. Please, I am not bragging. Her own eyes stared back, black against yellowing parchment. Her face portrayed an expression of glee almost alien to her, one she barely recognized. Her hands, more delicate surely than in life, clasped loosely beneath her chin, offering a gift. The realism struck her like a slap in the face, like she looked at a black image taken by the Shiekah Slate itself. “Thank you,” he whispered, still not meeting her gaze. He did not answer right away, shuffling to his bed, head hung in shame. Guilt racked her for a moment; he had never looked so heartbroken. His entire posture had slackened, and she could feel him slipping away from her into himself once more. She made her way to sit next to him, hoping to bring him back. The drawing sat between them, smiling radiantly. “I tried to make you taste it,” she snickered, recalling the events some weeks prior. She shattered. Deep within her chest until her own eyes pricked with the threat of tears and her hands went numb, every wall, every barrier, every defense she held to keep herself going dissolved beneath his words. In that one statement, he would never know, but he destroyed her. Not with malice, not with hate, but with truth. He saw more of her than she ever knew. They paused, waiting for the other to finish. “Go ahead,” Zelda said, voice cracking. A tear slipped down her cheek. “No!” she stammered, wiping her face. She could not look at him any longer; her eyes defocused and turned to the window. “No, it’s fine. I just did not realize how blind I have been. I never meant to hurt you.” She wanted to run. She always wanted to run, to just go and never have her failures thrown in her face again. And now, she had hurt Link. He had never been anything but loyal to her, and she had only ever been selfish. She did not deserve him. She felt the bed shift as he stood and put the drawing back on his desk. Soon, he appeared once more before her and knelt, until she was forced to look at him once more. Her hands shook, her whole body shook as they took each other in, completely fragile and exposed. He took her leg and proceeded to begin unlacing her boot. She sobbed. Gently, he removed her other boot. She heard him set them off to the side, then shuffle off, then return. Something wrapped itself around her shoulders and a small weight came down in her lap. She sniffed and wiped her eyes until she could see again. The Gerudo book sat waiting. She sniffed again and looked at him, patiently sitting next to her. He reached out and hesitantly rubbed his hand in small circles between her shoulders, over the red blanket. That was the second time she ever sensed doubt from him in his own destiny. Without thought, she threw herself on him and wrapped him tightly in her arms. 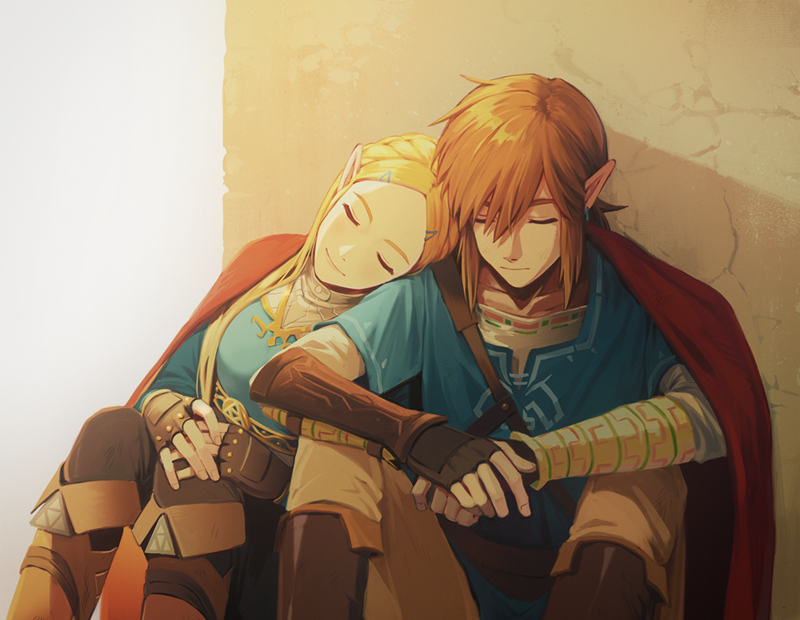 Link gasped in shock, going rigid, then relaxed and returned the embrace. This was right. The gossip mongers may have said otherwise, crying “scandal,” but curse them, too, right along with destiny. This embrace, feeling him so close to her, his heartbeat against her own, emotions combined in a tidal wave to sweep them off their feet, this was right. Where she needed to be for the rest of her life. He held her for what could have been eternity in silence, running fingers through her hair, while the outside world carried on. She wanted to stay there forever. Just let me stay here forever. He eventually let her go, and she sat back, wiping her cheeks dry. “Thanks,” he winked, settling next to her. She nudged him playfully. Hours passed, and Zelda had all but forgotten her nightmare that had brought her to Link’s quarters in the first place. His warmth comforted her, from the glow of his cheeks as he fought to write out the alphabet of a language he did not know, to the way he sat a little straighter when he successfully spoke his first rough, slow sentence. He did, hovering over the ink-covered parchment like he was studying a sacred text. She lay her head against his arm and watched his slow, precise movements, until the newest lines on the page introduced himself as a Hylian Knight of Castle Town. He smiled at her approval. “Urbosa will be pleased,” she said happily. His gaze lingered on her, something unspoken behind his eyes. She waited to see if he would express it, but he remained as studiously silent as ever, and the thought faded away. She wrapped the blanket tighter around her shoulders and carried on. It was not until his voice broke through a haze that had settled in her brain that she realized she had dozed off. He shook her gently. A groan escaped her lips, and she snuggled deeper into his blanket. It smelled like him. Was that weird? She hardly cared. The scent of wood and musk soothed her tired mind. She sank a little farther back into the haze. His smile broadened as he helped her to stand. She put on her boots, taking her time to squeeze out every last moment she could with him. Even as he watched her without word, she felt safe and content, like nothing else mattered. He laced her boots as he had unlaced them, and she beamed to herself. His careful movements, precise and delicate, betrayed the strong, noble warrior he showed to the world. His hands could wield any weapon, they guided the Sword that Seals the Darkness in a dance passed down through ages, and then they tied her bootlaces to get her safely home. He knelt before her not as a knight, but as a boy, just caring for a girl. As he rose, she lay her head in the crook of his neck for one last embrace. Her voice died. She stared for a moment, mouth agape, willing for the courage to speak her heart. Just say it. Just tell him. “Good night, then,” was all she could muster. He smiled and helped her out the window to the ground. Kat Vadam is a Copy Editor for Zelda Dungeon. She is incapable of writing Zelda fan fiction without a little Zelink love. Sixteen-year-old her is so proud. Follow her on Twitter.